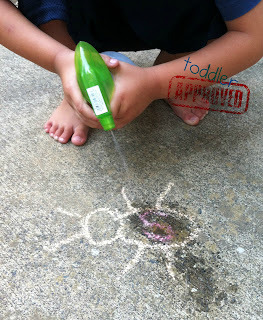 My children think there is something so magical about a spray bottle. So . . . we we took it outside to practice alphabet identification and called it "bug spray" - to them, it didn't seem like a learning activity at all, only a fun one. 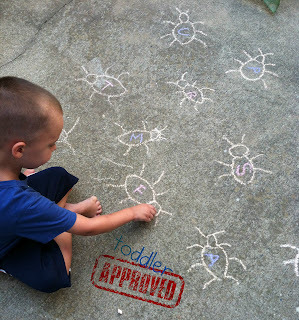 We first drew a bunch of bugs using chalk and assigned each bug a letter. Then I'd call out a letter or letter sound, and my son would apply generous amounts of our "alphabet bug spray" on the appropriate lettered bug. 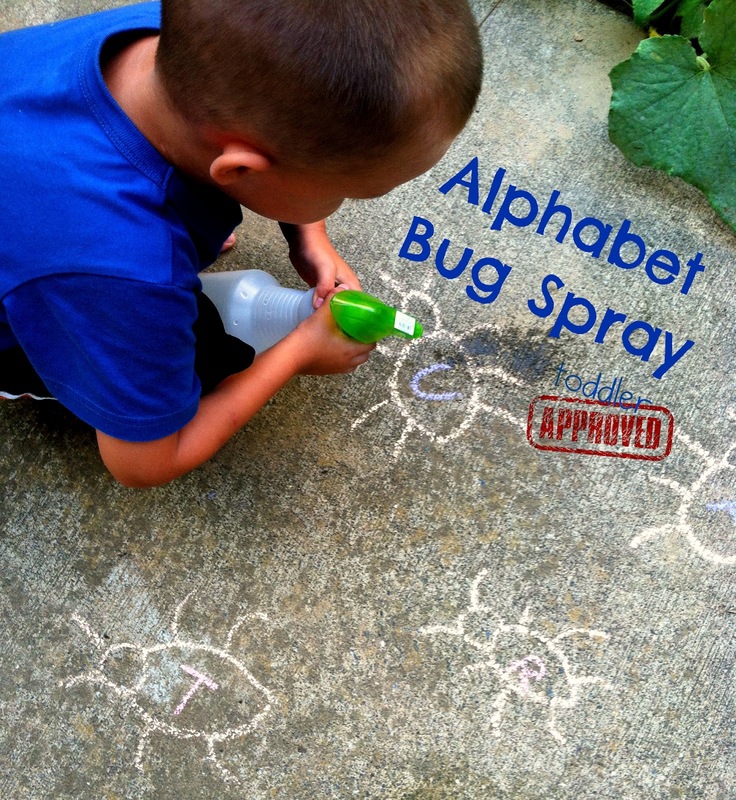 Of course, big sister didn't want to be left out and thought our version was too easy, so we wrote several simple buggy/insect words that she would have to identify by sight prior to spraying. I'm always amazed at how the simplest activities turn out to be the ones the kids love the most. How would you use this "bug spray"? What a cute idea. My little ones love spray bottles too. My boys love the spray bottle as well. I love this idea. Just pinned it and will try it soon. Great idea!! You could use colored chalk and have them find the color bug and squirt it!! What great fun! We will be doing this activity! Added to our Bug~Self Esteem week, Thanks! I'm a part time nanny for an almost 3 year old and his 15 month old sister. He has a water spray bottle that he adores! (And during hot Texas summers, it comes in handy!) 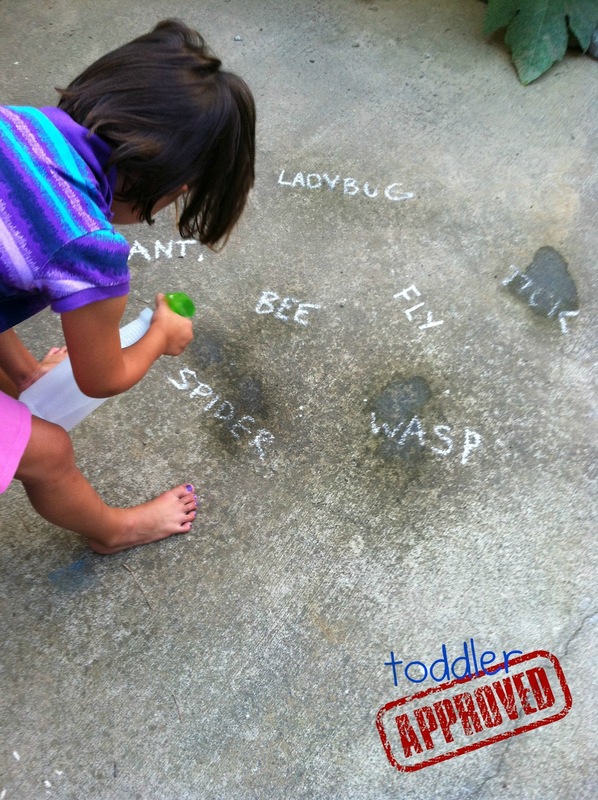 We had our own version of this game where I would write whatever letter he called out and then he would take great joy in washing it away...I love your version! Cannot wait to give it a go! Thank you for all of your great idea! This is a wonderful, fun idea. It will be a hit with the toddler play group tomorrow.